Sakai (堺市 Sakai-shi) is a city located in Osaka 大阪Prefecture, Japan. It has been one of the largest and most important seaports of Japan since the Medieval era. In the Muromachi Period, Sakai was one of richest cities in Japan. Sakai is located on the edge of Osaka Bay and at the mouth of the Yamato River, which connected the Yamato Province (now Nara Prefecture) to the sea. Sakai thus helped to connect foreign trade with inland trade. Sakai was an autonomous city run by merchant citizens. In those days, it was said that the richest cities were Umi no Sakai, Riku no Imai (tr. "along the sea, Sakai; inlands, Imai"; the latter is now a part of Kashihara, Nara). 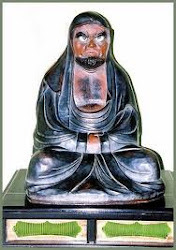 The famous Zen Buddhist priest Ikkyū chose to live in Sakai because of its free atmosphere. In the Sengoku Period, some Christian priests, including St. Francis Xavier in 1550, visited Sakai and documented its prosperity. After the coming of Europeans, Sakai became a manufacturing base of firearms and a daimyo, Oda Nobunaga, was one of their important customers. During his ambitious attempt to unify Japan, Nobunaga attempted to take the autonomy privilege from Sakai. Sakai's citizens denied his order and pitched a desperate battle against his army. Most citizens fled and Sakai was burned and seized by Nobunaga. After the death of Nobunaga, one of his men, Toyotomi Hideyoshi, seized power. Sakai became a prosperous city again under his reign. Sen no Rikyū, known as the greatest master of the tea ceremony, was originally a merchant of Sakai. Because of the close relationship between the tea ceremony and Zen Buddhism and because of the prosperity of its citizens, Sakai was one of the main centers of the tea ceremony in Japan. Sakai was still an important trade center during the Edo Period but was involved only in inland trade due to the Sakoku policy of the Tokugawa government. At the end of this era, Westerners again landed in Sakai but it resulted in a tragic incident because the Japanese citizenry and the foreigners were ignorant of each other's ways. French sailors from the Dupleix and Sakai citizens clashed; some French were killed, and subsequently the Japanese responsible for these deaths were sentenced to death by seppuku. 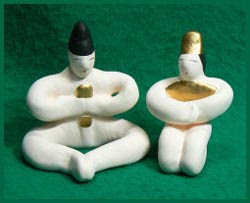 This incident is called the Sakai incident (堺事件 Sakai-jiken).
. tsuchi ningyoo 土人形 clay dolls . They have been made revived recently by the Tsushio family 津塩家, starting with 津塩政太郎 in the Taisho period. But when he and his fellow workers died, the tradition stopped. Most were well-treasured amulets sold at the New Year market. Since the Sengoku Period, Sakai, the "Venice of the Orient" has attracted foreign merchants and missionaries. 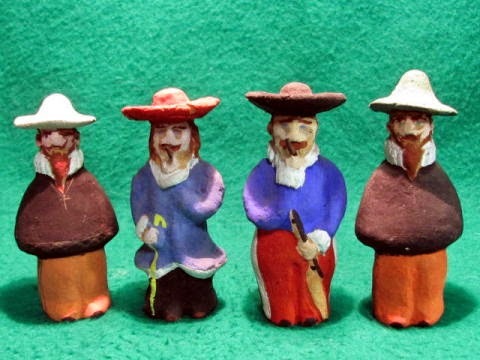 The clay dolls show these people in their traditional robes. Usually three were a group, a missionary in a black Manto coat, a merchant with a long pipe and a Portugese with a rifle. These dolls have not been made any more since about 1975. 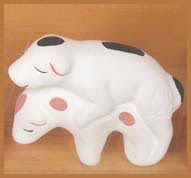 They are an amulet for a good couple. They come as a pair. The male doll wears a black official hat-crown and a long szepter. The female doll wears a golden crown and a fan from hinoki wood. They are a great gift for a wedding. 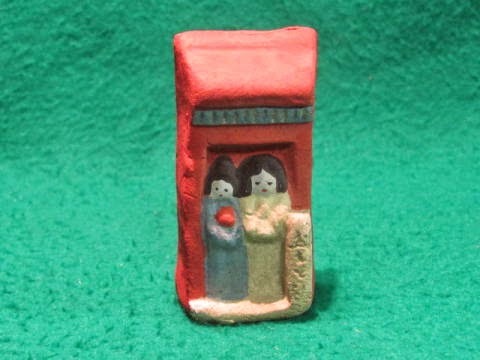 There is also a small clay doll of a couple of dogs in the act of ... well 睦犬 / 睦み犬 (mutsumi inu). hatsutatsu is a pun with hattatsu　発達 to grow and develop a good business, which is so important for the merchants of Osaka. So it is most helpful when bought on the first day of the dragon on each month. The people call it "Hattatsu san　はったつさん". 商売発達. on a day with an odd number you buy one with the left hand up. Within four years, you get 48 cats - shishuu hattatsu 四十八辰. Many people make their visits for the success of business or for the safety of family life. 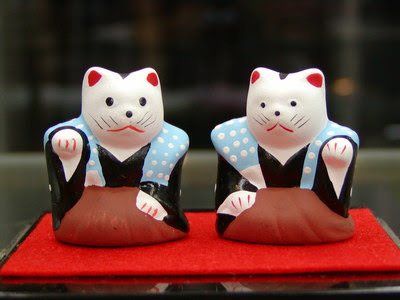 A small figure of a beckoning cat is popular among the visitors. It is said to invite fortune. After collecting 48 cats they will give you a bigger beckoning cat figure in turn. 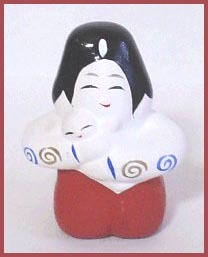 tanekashi san 種貸しさん "seed lender doll"
The figure is only 4 cm large and wears a red robe and hakama, carrying a baby in her arms. The miko shrine maidens at Sumiyoshi shrine were not allowed to have children. 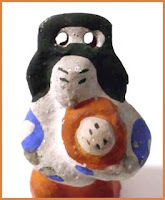 Now she is an amulet for getting pregnant and having a safe childbirth. Women who got pregnant after bying this amulet bring it back to the shrine in gratitude. 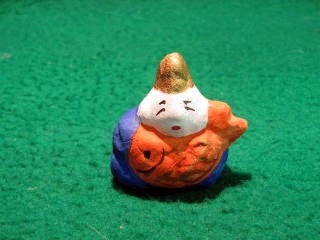 She is also painted on ema votive tablets of a small shrine in the compound, 種貸社. 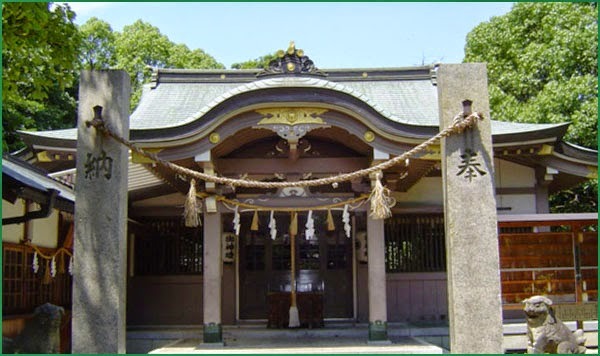 This shrine is also famous for the visit on the first day of the dragon (hatsutatsu 初辰). from 勝間村 Kotsuma village, about 1 km north of Sumiyoshi shrine (now 住吉区玉出). 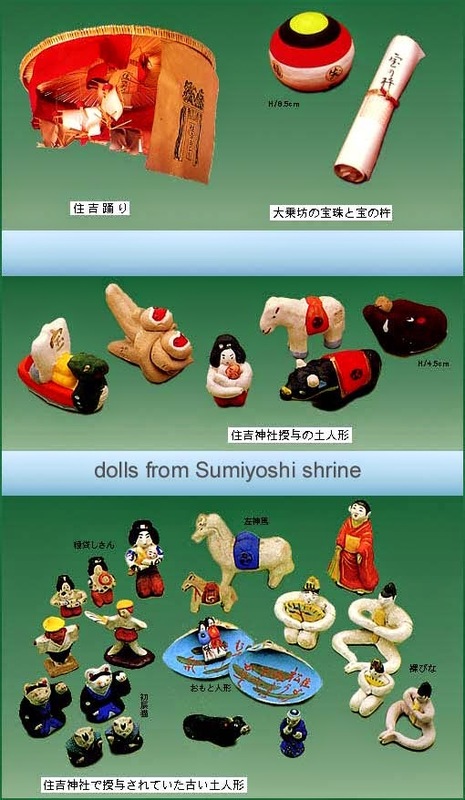 They have been made in the Osaka / Sakai area since the Edo period, till beginning of Meiji, as a special souvenir of Sumiyoshi shrine. 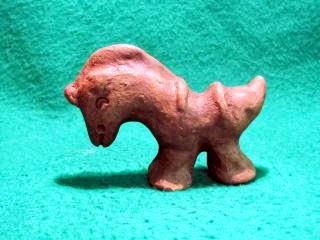 They come in many shapes and made from various materials. 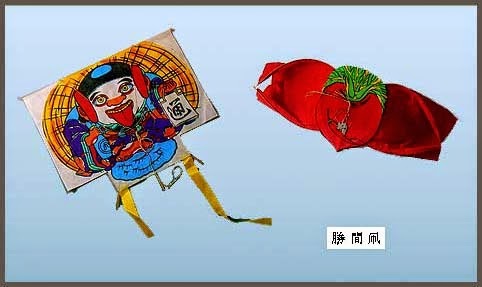 The one on the right represents a "red radish" kite かぶら凧. The one on the left is a 豆狸 "small tanuki" carrying a flask for sake and a book to enter his debts for drinking. 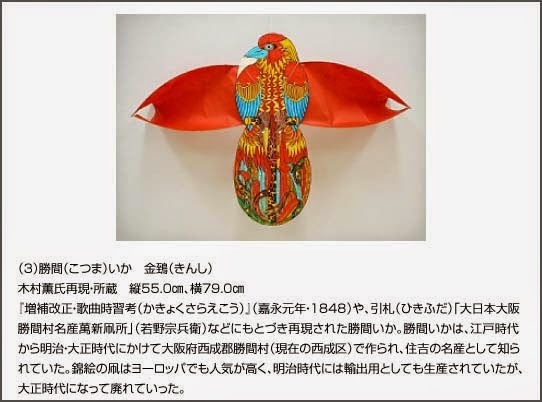 This kite is embroidered with gold thread and this kind of kite has been admired a lot outside of Japan too. Sumiyoshi pinpin tai 住吉ピンピン鯛 sea bream "alive and kicking". 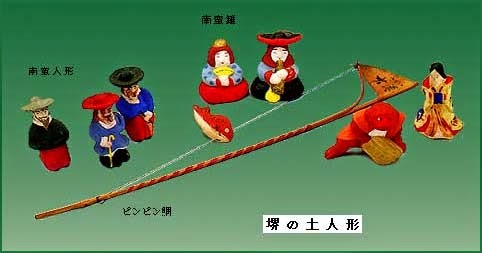 These kinds of sea bream toys have been made in other parts of Western Japan too. 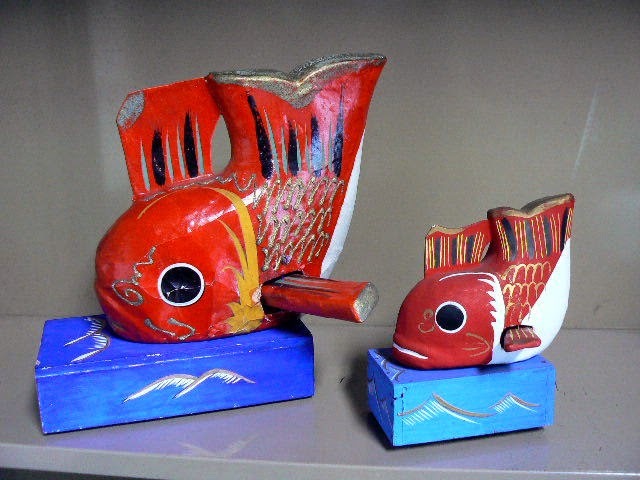 They were given to children with the wish to prevent them from getting smallpox or other diseases, and stay as healthy as these fish.
. Sumiyoshi Shrines 住吉神社 . 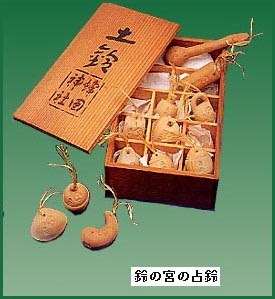 鈴の宮の占鈴 clay bells for divination from the "Shrine for clay bells". They are only sold two or three pieces every year, on the day of Setsubun 節分の日, the "seasonal divide" on February 3, through a lottery. There was a special shrine ritual for that day, 鈴占神事. This ritual is more than 1000 years old. 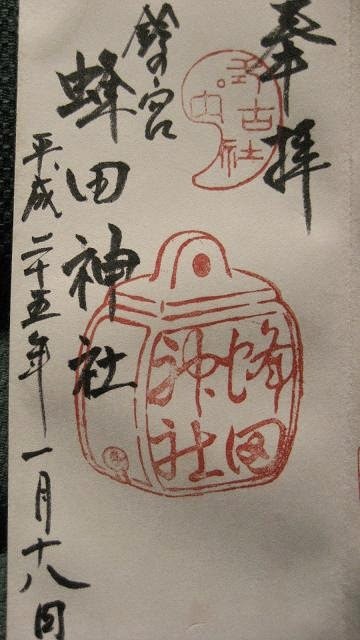 A person called Hachida Ren 峰田連 had made 12 clay bells and offered them to the shrine in Spring. When the priest rang the bells, they would foretell the outcome of this years harvest and good fortune from the sound of it. The stamp of the shrine also features the old clay bells. During the 14th century Sakai became the capital of the samurai sword making. The city kept its position during the centuries to come, and in the late 16th century they started making knives according to the same methods as the famous sakana swords. The making of knives was a result of the Portuguese introduction of tobacco in Japan. The demand for quality knives to cut the tobacco exploded. The first tobacco knives were made in Sakai, and they were soon renowned all over the country for their unique sharpness. The so called Meiji Restoration took place in the late 1860’s. The shogunate lost its powers, the empire was reintroduced and efforts were made to modernize Japan. The samurai class lost some of its privileges and was no longer allowed to carry swords. Even though the army still needed swords, the demand sank and many of the manufacturers started making knives instead. includes several steps which all require great skills. The smith forging (hizukuri), when the metal is heated an hammered to its shape, the sharpening and honing (hazuke or togi), when the blade gets it sharp edge and finally the hafting (ezuke), when the blade is attached to a haft, or a handle, of magnolia wood. uses the same technique as the masters of old did. Sakai cutlery consists of layers of soft ferrite and hard steel, heated to 1300 ° C and hammered together. The most difficult aspect of the process is maintaining the heart at the exact temperature; too hot and the blade will chip easily, too cool and the steel and the ferrite will fail to bond properly. is heated, hammered and cooled in different steps and at different temperatures. Asymmetries are not accepted and the blade is meticulously treated with hammers of different size to make it no less than perfect. It takes long practice and great skill to make an excellent blade. is then sharpened and any remaining asymmetries removed by using increasingly finer whetstones, giving the edge its right angle and sharpness. The last step is to carefully hammer the blade into a haft of rot-resistant magnolia wood, marked with the manufacturers seal. A high quality piece of Japanese culture and skills is ready for shipping.
. Sakai Cho, Sakai Machi in Edo 堺町 .